how to calculate the surface area of a cone when given the slant height. how to calculate the surface area of a cone when not given the slant height. how to derive the formula for the surface area of a cone. 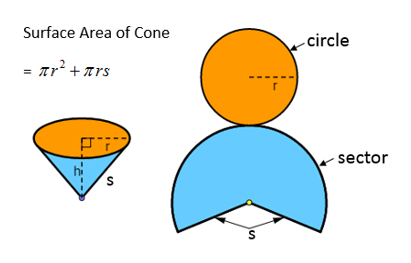 The following figures show the formula for surface area of a cone. Scroll down the page if you need more examples and explanations. A cone has a circular base of radius 10 cm and a slant height of 30 cm. Calculate the surface area. How to find the surface area of a cone when the slant height is given? What is the surface area of the cone? Round the answer to the nearest hundredth. The following video shows how to find the surface area of a cone when not given the slant height. How to calculate the surface area of a cone when the slant height is not given? The Pythagorean Theorem will be used to calculate the slant height using the radius and height of the cone as the right triangle's legs. Example 1: A cone-shaped roof has a diameter of 12 ft. and a height of 8 ft. If roofing material comes in 120 square-foot rolls, how many rolls will be needed to cover this roof? Example 2: The height of the Pyramid of Menkaure is 216 ft and the side of the (square) base measures 346 ft. Find the lateral surface area. This video shows the derivation of the formula for the Surface Area of a Cone. How to derive the formula for the surface area of a cone? In this lesson, we'll take a cone, slice it, squash it, dissect it, and figure out a formula for its surface area.